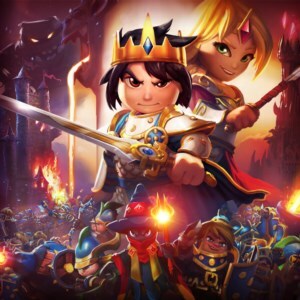 RoyalRevolt 2 is a one of a kind game tower defense game created by FlareGames. The most unique feature is commanding your troops on the attack phase. Most other tower defense games are one-sided. You are the defender, building and upgrading towers along a defined path to destroy an onslaught of enemies. If you're lucky, some of those enemies may even attack you towers, but even this is rare. On top of an attack phase, RoyalRevolt 2 also features beautiful graphics in their 3D world. The gameplay of Royal Revolt 2 is easy to learn. There are only a handful of buildings with pre-defined building locations. This means there is no customization of how your town's buildings are built and configured (like in Clash of Clans). Starting construction (new or upgrade) is a a couple of touches away. One unnecessary design of the game is the need to "collect" or acknowledge a building upgrade before another construction task can begin. Even though completed construction is marked with a huge green arrow, it can sometimes be difficult to locate (especially for anything with longer than a 12 hour build time). Other than that, attacking is easy, just drag your finger along the path. Your troops will follow your hero, kind of. Sometimes they go off to the next most important building. Any building that isn't a tower has a pre-defined build location. Depending on progress in the game, they can b upgraded to open up new features. These buildings include the Throne Room, Treasure Chamber, Troop Academy, Castle Guard, Inventor's Workshop, Farm, Tavern, etc. Each building contains different upgrades to improve your ability to attack, defend, or store resources. My overall thought on RoyalRevolt 2 is it's a very well designed (graphically and user interface), but lacks enough active users to make playing fun. Having a previous attack replay feature would add a whole new segment to the game. Since I don't know how I am being attacked, I don't know the weaknesses in my towers and how my towers can be improved. After about a week of playing, I felt like I was attacking the same thing and the game quickly lost it's replay value. There are only so many ways to direct and place towers along a path. If you haven't already, head over to the Android App Store or iPhone App Store and give the game a try. It's free with various in-game purchases that are not necessary, but available if you'd like to speed up your progress in the game.